A quickly arranged friendly with new beasts-on-the-block, the Nepali Tokyo Rhinos, was a great day out, albeit a tad chilly at the end. It got us a bit of match practice, it was a chance to see some new Shark faces and the Rhinos are a really nice bunch of fellows. The Rhinos were an even dozen but Sharks had 14 so we went with 2 x T20 games. Rhinos called the coin correctly and decided to have a bat. The Rhinos were soon in trouble at 2-6. Marcus in his debut as T20 captain for the Sharks threw seven bowlers around sensibly and wickets fell fairly cheaply and regularly. We were troubled by wides (20) but at halfway Rhinos were 4-40. On the back of a superb 52 not out from No. 3 (and now SHARK!) Ajay Thukur, Rhinos recovered to post 8-110 of 20 overs. Great support in the field with 5 catches and two runouts. All-round team effort.  Neel was literally unhittable! In snapping up both openers for ducks for 2-5 off 2 overs, all those runs were wides!  ‘Kazu’ Arata snuck in one over 0-4.  Vipin, who came to us looking to umpire, slipped seamlessly into Shark legend Sankar ‘The Assasin’ Prodhan’s deadly shoes by taking a nice catch at point and being on the beginning of two run outs. Also picked up a wicket (2-1-8).  Mairaj got under and held a critical catch. We had an even distribution of national bats (Marcus and Arata), young batting U/19 talent via My-Ys (Neel, Ishaan, Deba) and a mix of the mercurial, the experienced and the unknown. Into Over 10 we were looking really good at 2-60, with opener Ishaan batting a veteran and heaps of talent to come. A classic Shark collapse of 4-2 (inc. two runouts) soon saw us 6-66 (!) at Over 13 then 7-84. National pair Marcus and Arata knuckled down to move us to 108, with just 3 to get off lots of balls… We unbelievably managed to lose 3-0 and drag an easy win kicking and screaming into the delighted jaws of defeat!! Oh, boy.  Ishaan played with time, maturity and 7 lovely boundaries in a wonderful debut of 37 as opener.  Vipin’s effortlessly elegant cut behind point was perhaps the shot of the day.  Mairaj’s working of the offside angles was glorious.  The Marcus-Arata partnership was brutal but juuuuuuuust a tad short.  Not one but TWO Shark collapses! Combined total of 7 wickets in 3 runs – fair effort! With Mairaj, Asala, Sanjeewa and Vipin back off to Tokyo some National and Sharks heavy-weights muscled or sashayed into the team: Rui, Takady, Anton and KB. Sharks took up the bat. With the openers back in quick time (ALW AGAIN to a GOAT of a catch at slip – it was good) the middle order rallied with ferocious partnerships to take us very rapidly to around 100 for 6 off 15. BUT, a large random feral collapse (rumoured to resemble Dinsdale Pirahana’s nemesis, Spiny Norman) still lurked hungrily in the crackling and prickly Sano 1 undergrowth… From 6-112 with 3 overs and young running machines to come we ended up 10-118 off 19. The collapse burped, contentedly. The score was probably a bit on the light side but with the inclusion of National bowlers et. al. we were confident of a good show with the ball.  Deba (19 off 32) sensibly dropped anchor at No. 3 to start the rebuild with the middle order.  Arata (29 off 18), Takady (23 off 17) and Gaurav (18 off 9) had only 11 dot balls between them and boundaries pounded to all parts of the ground. On the score sheet there was a section for ‘Weather Conditions’. The Nepali scorers enter it as, quote, “Extremely cold”, unquote. Now THAT’S cold. About the only thing not cold was the opening swinging heat sent down by Rui and Neel. If Rui was Jimmy then Neel was Beckham. They wore some edgy runs at first but the bats were never settled. Enter Takady and two wickets materialized at 28. With the door propped opened Takady and Yugi stepped in and sent down seven overs of wonderful line, length and flight spin. Again Ajay Thukur at No. 3 stood between us and an early trip home and again we could not remove him from the crease (n.o. 22). Gaurav chipped in with a wicket but it was the lately-debonair KB who mesmerized the Rhino tail like a Crocodile Dundee water buffalo. Rhinos all out for 99 in 18.5.  Rui’s opening was a bit wayward but once he hit his line he was too good as ball after ball slide past the probing bat or was just kept out. 3-17-0 off 3 overs.  Neel reeled of his four overs straight for 2-21. He copped a bit but got a nice LBW.  After the worst Takady ball in history (which he dropped on its way back at him), next ball Arata pulled the catch of the century. From there Takady was almost unhittable except for the other two catches sent to Rui and Gaurav. 3-8 (inc. one 4) off 3 over. 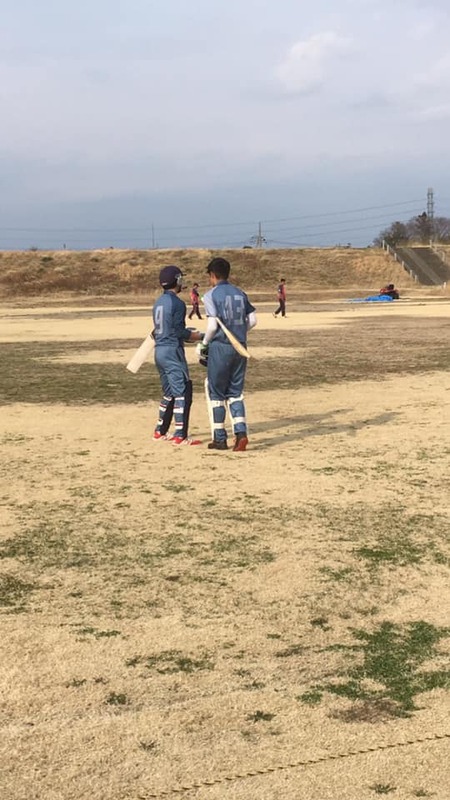  Yugi 0-13 bowled a great line and length in his four overs, effectively locking down one end and only giving up miserly singles. This kid is going to be a handful for batsmen!  A sufficiently chilled KB was uncorked late with a quick-mix bag: another Rui catch at midwicket, a smart stumping by Marcus and an LBW. A madcap attempt to escape the strike ended in a smart run-out by Marcus to finish the game. 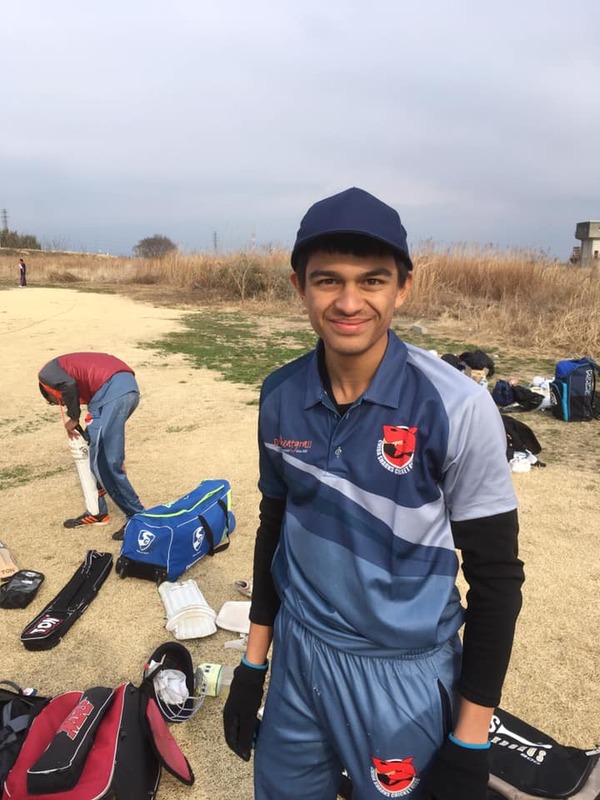  We held five solid catches in the field: two to Rui, one each to Deba and Gaurav, and a blinder from ‘Kazu’ Arata at shortish cover. A hit off Takady’s second delivery looked like it was clearing him easily. No – he leapt up and backward at the same time and seems to take it backhanded in his left hand! Amazing catch!  We sent down only 5 wides. We can do it if we try. It was eventually a cold but great day out. We should have come away with two wins but we are happy to split it with the Nepali lads who played with great skill and spirit through the day. Really nice to meet a new team in the Tokyo Rhino’s, two of whom will hopeful now play for us in the JCL. The Rhino’s will be in the West Kanto Japan Cup and we wish them good fortune. We cannot say enough thanks to Matsumura-san for his super-human umpiring of both T20s in the cold. 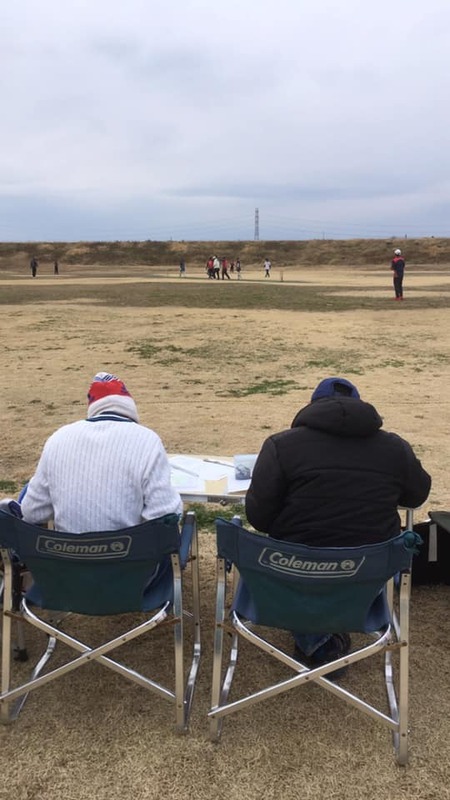 Almost 80 overs – that is a Test match in some places – and close to 40 wicket decisions of all kinds in a day! ありがとうございます! The Sharks teams showcased our positive past and future. Established players, the old gnarlies and it was wonderful to see so many new guys in, including the mob of rabbit-fast MyYs, who not only made their mark with bat and ball, but cut off runs and held catches. Saves the oldies the trouble! 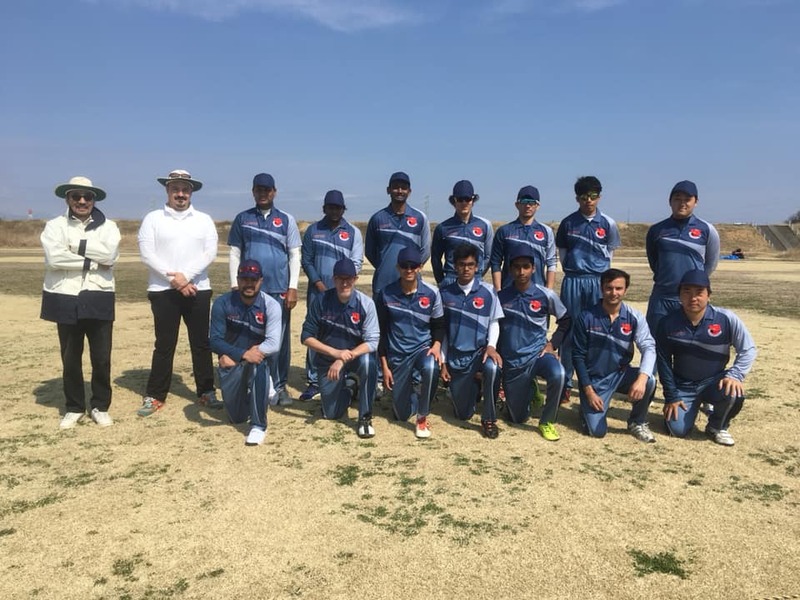 Cricket 2019, or soon to be Reiwa (令和) 1 – the World Cup, the Ashes, the Chiba Sharks – is here! It’s already got me on my knees, beggin’, darlin’, please and easin’ my troubled mind.